Are Père et Fils the real Bush twins? Photograph of George H.W. 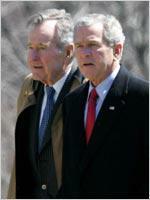 Bush and George W. Bush by Saul Loeb/AFP/Getty Images. [P]ublic opinion about George Bush has touched not one but two outer edges of the known galaxy of presidential popularity. First … he scored the highest approval ratings of any president since World War II. Then … he plunged to the lowest level of public esteem ever measured, in the same postwar era…. Eerie, isn’t it? If you go by approval ratings, father and son are practically the same person. The only significant differences are that the 43rd president’s belly-flop was spread over two presidential terms rather than one and that it was a slightly exaggerated version of the 41st president’s trajectory. Jake Weisberg, in his excellent book The Bush Tragedy, argues that Bush came to believe he could succeed only by doing, in any given instance, the opposite of what his father did. In doing so, he presided over a presidency far worse than his father’s. But future generations may never notice, as they work laboriously to tell them apart.